7 months after my visit to Networkers in USA/Orlando, i visited Networkers in Europe/Barcelona this time. Different continent, different county, different city, different experience, same ranking model. 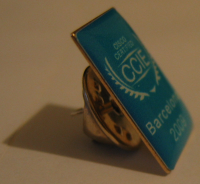 for the CCIE party too. Center             my visit to Orlando). the other adjacent speakers) and WCs seemed not enough. Also, in some rooms lighting seemed more than needed. there), 2h lab (Nexus) was entertaining (but short). were available during the actual "interesting" sessions. have a quick look at your desired schedule. Snacks        A-   Snacks were delicious, dessert was top! session speakers themselves and one by a friend). Conference    D    A supermarket bag would have been better! Bags               I still wonder whose idea it was to give this hard-plastic made bags. my notes from the floor (as many others did). (not everyone has a CD/DVD player on his netbook). Internet      A-   I had my EeePC and wireless was ok on every spot i tried. Access             PowerStations was a very nice idea, but more should be provided. CCIE Lounge   A+   Excellent idea! Much quieter and less crowded than other areas. Room               such a low temperature?). recertify my CCIE for free. Keynote            plus a very interesting EnergyWise demonstration. This man knows how to capture attention. or have buses for transportation. a nice and clever addition. Basketball acrobatics was the best show. of cisco engineers, don't miss the networkers events! 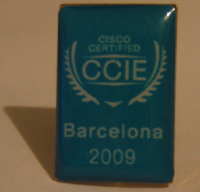 Btw, Cisco should have more strict policies regarding the usage of its engineers' usb sticks. I got a usb stick from a speaker in order to copy to my laptop an extra presentation and i found some -hidden- passport & id card scans into it! I guess someone should inform them to be more careful about where to store their personal stuff. PS1 : During the event i met and had great time with Greg (etherealmind) & Jeremy (packetlife). Greg is the type of guy who has done almost everything in his career and he is not afraid to change his way of living in order to do more. Jeremy, on the other hand, is much younger (his photo can confuse you), but with a very bright future that he's looking forward to meet. Both were excellent companions during the event and i wish it would last longer (sorry guys for leaving early the last day, but i had a job to finish). See ya around. I don't know if you had the chance to do some sightseeing but I myself found Barcelona one of the most beautiful and exciting places I've ever been to! @wintech2003, good to see you back. I didn't have enough time for sightseeing (i booked everything a week ago and i didn't have time to think). But, judging from a quick look during the last day (while my "personal" tourist guide got lost :-P), Barcelona is indeed a very beautiful place. Hopefully, i'll have another -more prepared- visit next year. The CCIE "kind-of-wallet" is actually a passport holder. You could also put your credit cards and bank notes in there but the primary purpose is for your passport. @Angela, why Passport holder? I was surprised. Great to hear Chambers had his usual impact. One year CCIE - Was it worth it?